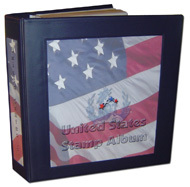 Our Full Color Stamp Album Pages Complete With Album. Here you will find our Volume Collection of United States Full Color Stamp Album Pages already for you to add your stamps. They include Full Color Stamp Album Pages, Page Protectors and our ALL NEW 1-1/2" inch Freedom D-Ring Album Binder.